Susan Hoff has been manning decks of sailboats since she was 14, so what better material to use for her super-beachy line of tote bags than recycled sailcloth? But Hoff doesn’t desist at maritime materials. The San Francisco-based designer also pilfers retired horse reins and rare vintage kimonos to create her practically perfect (and perfectly practical) carryalls. Hoff’s upcycled bags exude the same clean, buttoned-up style that is the hallmark of the sailing world. And she should know that milieu better than most, considering that she has a 100 Tons U.S. Coast Guard Captain’s license. In fact, it was during Hoff’s time as a sailing instructor with Outward Bound in Maine when a friend gave her a historic cotton sail. “I’ve been hooked on sails ever since,” she tells Ecouterre. Hoff’s upcycled bags exude the same clean, buttoned-up style that is the hallmark of the sailing world. 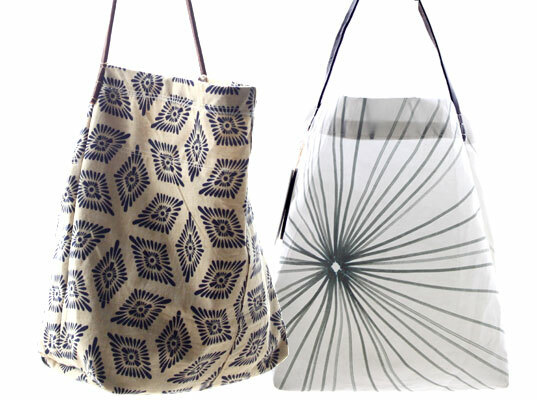 To create her bags, Hoff sources used sails from boating friends who have upgraded. Each sail is different and their shapes, colors, and lettering often inspire new designs. For handles, Hoff tacks on worn-out horse reins from her mother’s horse farm in the Midwest. Sun, air, salt, and sailcloth. It’s enough to make us want to lace up our boat shoes, head down to the marina, and feel the wind whip in our hair. 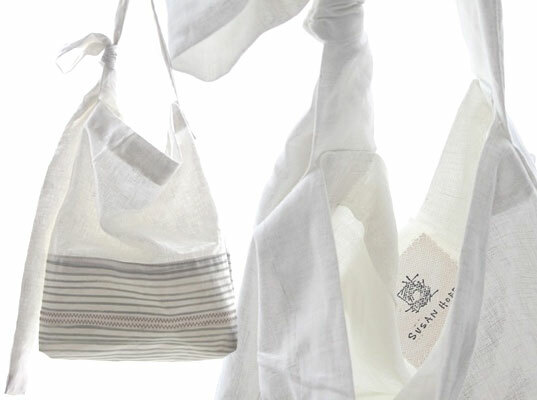 Susan Hoff has been manning decks of sailboats since she was 14, so what better material to use for her super-beachy line of tote bags than recycled sailcloth? But Hoff doesn't desist at maritime materials. The San Francisco-based designer also pilfers retired horse reins and rare vintage kimonos to create her practically perfect (and perfectly practical) carryalls.